Perfect for when you’re just back from work or the gym, these fajitas are packed full of lean protein, are fast to make and don’t skimp on flavour. Cut the steak across the grain for a tender eat and don’t hold back on the extras. Bang up the quantities if you’ve got loads of people coming round. 1. 30 minutes before cooking, remove your steak from the fridge. Trim off any exterior fat using a very sharp chef’s or filleting knife. Check which way the protein and fat lines run through the steak (the grain of the meat). Take your knife and make swift, clean cuts across the grain, dividing the steak into 1–2 cm wide strips. 2. Combine the marinade ingredients in a non-metallic bowl and mix well. Place your meat in a bowl and cover with the marinade. Organise your extras. 3. Put a griddle pan on to a high heat until almost smoking. To check if it’s hot enough, drop a bit of cold water on the griddle pan – if it spits and evaporates, it’s ready. Use a pair of tongs to drop strips of steak, well apart, down onto it. 4. Cook for 10 seconds then turn quickly. Cook for another 10 seconds. Shift the meat to a plate and sprinkle with a little salt. Rest for 2 minutes. 5. Meantime, warm the tortillas either foil-wrapped in a preheated oven, or one at a time, a few seconds a side, in a dry hot pan or a microwave, till soft and pliable. 6. 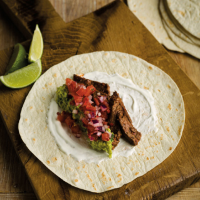 Spoon a bit of sour cream, guacamole and tomato salsa into the centre of your tortilla. Layer in strips of beef and add the grated cheese and lettuce. Now roll up like a cigar using a bit of guacamole to hold it together. If you’re making more of these to feed lots of people, serve your extras into bowls on the table and let everyone help themselves instead. If you can’t get hold of sour cream, add 1 tbsp lemon juice to a 300ml tub of double cream, leave for 1 hour and use in its place (or substitute with yoghurt). Use skirt steak as an alternative - It’s cheap and tasty – just marinade for longer. This recipe was first published in Fri Sep 07 13:53:53 BST 2012.